The weekend spent in Kaberneeme Vacation House was exceptional! Big thanks to the host! Tanel kindly welcomed us himself in the evening and showed us the house. He was always available through whatsapp and ready to satisfy all our special needs. The house itself is quite small, nevertheless suits perfect for a company of 5-6 individuals. It's well equipped: you will find a dishwasher, oven, microwave and even a toaster in the kitchen. Sauna can hold up to 4–5 people at a time. The fireplace is fully functional and ready for cozy evening gatherings. The way to the seashore takes about 5 minutes. A cozy and well-maintained cottage located in nice surroundings in a lovely village. Suits well adults traveling without kids and families too. Easy access to shoreline, sea is just around the corner. Friendly and flexible host made our stay very nice. Will definetely visit again! Our stay in the Kaberneeme Vacation House was just perfect: The Vacation house is a beautiful cosy and quiet house surrounded by garden and trees and only a few steps away from the coast with a beautiful sandy beach. The house has a modern equipment (for example new kitchen incl. dishwasher, oven and microwave, wlan, sauna, 3 showers, 2 toilets). Tanel, a very kind, sympathetic and polite host, welcomed us himself and showed us all, cared about our well-beeing and satisfied our special needs. The organisation was easy and Tanel responded always quickly. As our host also the habitants of the cute little village Kaberneeme were very accomodating and cheerful. There is a little shop where you can find all you need and a nice little cafe with delicious homemade cakes and food. We completely felt well and enjoyed our stay in Kaberneeme. Lucky to have found this little gem. Had an amazing stay together with the family. Host was nice, flexible and helpful. Also great there was airconditioning. Will certainly come back! Very clean, excellent location, great sauna, beautiful living room, the friendly owner Tanel, close to the sea. Very tidy place with fantastic kitchen that has anything you might need. Great spot for bbq that is covered, so can be used even if it’s raining. Logement spacieux, le sauna... 2 salles d'eau. Everything was gorgeous, nothing to add))) very recommend. I wish we have more time to spend there, one day is not enough to enjoy the beauty of the nature. Sauna there is right what we were needed after long trip. Die Einrichtung der Wohnung war schlicht und geschmackvoll, die Küche gut ausgestattet, auch um richtig zu kochen. Das Haus liegt in einer idyllischen, erholsamen Umgebung und in Strandnähe. Lock in a great price for Kaberneeme Vacation House - rated 9.4 by recent guests. Kaberneeme Vacation House is located in the Kaberneeme village, 100 yards from seashore and 23 miles from Lennart Meri Tallinn Airport. Guests have access to a sauna and summer kitchen. 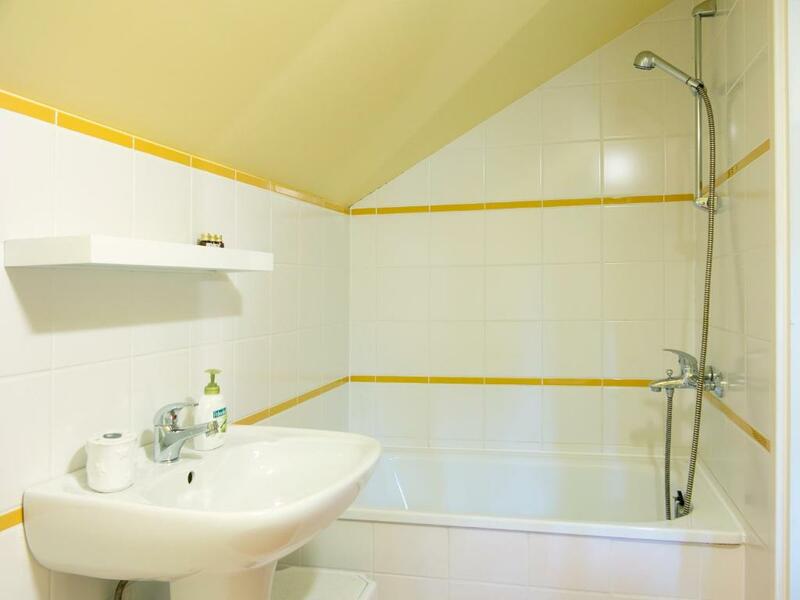 The apartment comes with a kitchen and bathroom upstairs, as well as a smaller room with shower downstairs. Both rooms have the view of the garden. There is a terrace with outdoor furniture, accessible from the smaller room. This property also has one of the best-rated locations in Kaberneeme! Guests are happier about it compared to other properties in the area. This property is also rated for the best value in Kaberneeme! Guests are getting more for their money when compared to other properties in this city. Kaberneeme Vacation House has been welcoming Booking.com guests since 6 Jun 2014. When would you like to stay at Kaberneeme Vacation House? We offer a possibility to rest on the northern coast of Estonia in one of the most beautiful villages in Harjumaa (Harju county) – Kaberneeme. The studio apartment upstairs with a kitchen and a bathroom accommodates four people and the small bedroom downstairs two people. As we wish to offer peaceful relaxation, the entire vacation house is rented out as a whole. The price also includes an opportunity to use a summer kitchen with grilling facilities and sauna during your stay. Our vacation house is located 40 km from Tallinn on the west side of Kaberneeme peninsula, 100 m from the sea. The sunsets are miraculous here. Highly evaluated Neem restaurant is situated half a kilometre away at Kaberneeme Marina. Kaberneeme shop (opened daily from 10 A.M. to 8 P.M., 11 A.M to 7 P.M. at wintertime) is situated 1 km away close to the bus stop. In the same building with the grocery store, there is a lovely hipsterish summer café Pootsmani Suvekohvik opened during summer time. House rules Kaberneeme Vacation House takes special requests - add in the next step! Please inform Kaberneeme Vacation House in advance of your expected arrival time. You can use the Special Requests box when booking, or contact the property directly with the contact details provided in your confirmation. 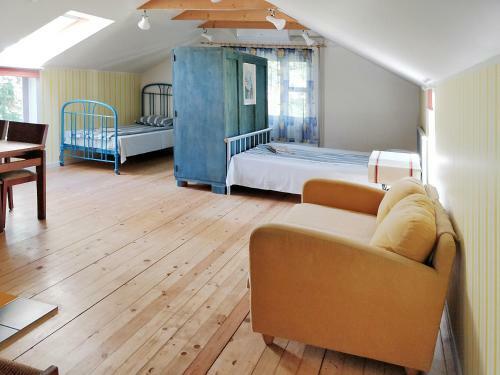 The host house is situated on the same site in about 50 meters from the Kaberneeme Vacation House. Someone may feel uncomfortable for this reason. But you should not worry about it, because Tanel is a great host. He has never bothered us during the stay. The bed was a little too soft for my taste, but that really is personal.